While Palladium Books 'Compendium of Contemporary Weapons' has lots of good information, the stats on the damage that the different rounds do has so many ambiguities it makes my eyes bleed (ie the same round doing drastically different damage from functionally nearly identical platforms.). This is my attempt to clarify and standardize some of these issues. There are only two listed for SC/Invid era so I may develop some home brewed ones in time. Following the 'Rain of Death', most manufacturing in Eastern Europe and Western Asia were reduced to 1960-1980's era capabilities. With little to build off of, the reborn Soviet state reserved what Hi-Tech capabilities they had to orbital space capabilities (ie piracy) and mecha R&D. Their conventional forces returned to the Stalin era methodology of "Quantity has a quality all of its own". Easily/cheaply produced, reliable, and rugged are the trademarks of Soviet military. While stocks of some more modern firearms are occasionally unearthed in the many ruins across the devastated landscape (such as German H&K rifles & submachineguns and AK-100 series), these are the exceptions and not the rule, usually being issued to infiltration and undercover operatives or supplied to Hi-tech bandits that have proven reliability and results. 9mm Makarov Self-Loading (PM). (Russian: Пистолет Макарова, Pistolet Makarova, literally Makarov's Pistol) Standard sidearm of E.B.S.I.S. forces. VZ61 Skorpion Machine Pistol: One of the only non-Russian designs adopted. Often issued to officers, Spetznaz, and mechanized/armor crews. Range: 50 m (164 ft). AKS-74U: (укороченный; Ukorochenniy, or "shortened")Packing more of a punch than the Skorpion, this derivative of the AK-74 is also commonly used by Spetznaz, airborne forces and mechanized/armor crews. Approx. Effective Range: 200m . AK-47 (all variants): Avtomat Kalashnikova (Russian: Автомат Калашникова образца 1947 года or "Kalashnikov automatic rifle model 1974"): One of the most commonly recognized firearms in history, the AK-47 was and is present in numerous forms on every continent on Earth. The huge numbers of these that survived the Rain of Death and produced afterwards guarantees Soviet support for this older but ubiquitous design. AK-74 (all variants): Having supplanted the AK-47 in Russian forces prior to the Global Civil War, large stocks of these survived the Rain of Death and continue to be used by E.B.S.I.S. forces. More common among continental troops and 'official' E.B.S.I.S. bases. 650 rounds/min., Approx. Effective Range: 500 m (1640 ft). SVD Dragunov Sniper Rifle: (Russian: Снайперская Винтовка системы Драгунова образца 1963 года Snayperskaya Vintovka sistem'y Dragunova obraz'tsa 1963 goda (SVD-63), officially "Sniper Rifle, System of Dragunov, Model of the Year 1963") Standard sniper rifle of the E.B.S.I.S armed forces and their allies. Range: 1300 m (4265 ft). RPK (and RPK-74): (Ruchnoy Pulemyot Kalashnikova, Russian: Ручной пулемёт Калашникова or "Kalashnikov hand-held machine gun"). A light machine gun/Squad Assault Weapon (LMG/SAW) regularly used by infantry troops. It uses the same magazines and ammunition as the AK-47 (RPK) or AK-74(RPK-74). PKM (ПК Модернизированный: "Kalashnikov's Machine-gun Modernized") (and variants): Standard General Purpose Machinegun of the Soviet forces. Often used as a turret mounted support weapon. Cartridge: 7.62x54R, Damage: 5D6, Feed: 100rnd belt, Weight: 7.5kg, Barrel Length: 645mm(1192mm), Muzzle Velocity:825m/s, Approx Eff. Range: 1000m. Effectively staying out of the SC/Masters war, the E.B.S.I.S. still had little luck with energy weapons, their only unique firearm being the NM-30 pulse rifle developed late in the war. All of the Macross era firearms are still very common. Koskov-47: A direct copy of the UEEF's FAL-2, it became a favorite of Soviet forces and the South American black market. It was standard issue until the arrival of the Invid. NM-30 Pulse Rifle: Developed shortly after the defeat of the Masters, this was not quite the success hoped for an independently developed energy weapon but was still produced as an export to allies. 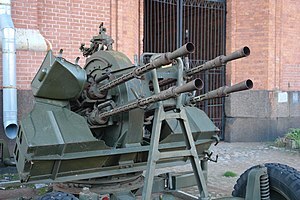 A conventional heavy machinegun that is commonly mounted on armored vehicles, mecha, and anti-aircraft platforms. It can fire conventional S.D.C. rounds or High Explosive Armor Piercing (HEAP) rounds that do M.D.C. damage. These latter are expensive to produce and are usually limited to the elite mecha units (such as the Juggernaut) or when it is anticipated that enemy (iow RDF/SC or Zentraedi) mecha contact is likely. Note that the Soviet rounds are NOT interchangeable w/ RDF mecha. An ultra-heavy machinegun too large for standard personnel use. It is normally mounted on vehicles(ex BTR-70) and/or used as an anti-aircraft platform (Ex. ZPU series). This machinegun also has conventional and HEAP rounds available. 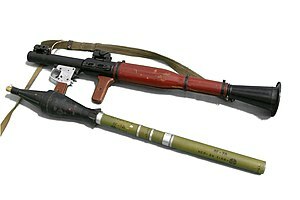 Cheaply produced, reloadable, and portable, the RPG-7 is issued in large numbers to E.B.S.I.S. troops and exported to allied nations, high-tech bandits, and mercenaries around the world. While it can rarely severely damage the main body, RPG sharpshooters can blind or cripple mecha by hitting sensors, weapon ports, or limbs. Like the AK-47, there are copies manufactured both officially and unofficially. 10ft. Effective Range: 100ft (30m). Damage: 1D4 x 10 S.D.C. Designed to be attached under an AK-47 or 74, similar the the old U.S. M203. 9M14 Malyutka (Russian: Малютка; little one, NATO reporting name: AT-3 Sagger) Mass produced Anti-Tank Guided Missile. Lightweight enough to be portable by ground troops, it is also commonly used by armored vehicles and aircraft. Minimum Range: 200 m (656 ft), Max Range 3 Km. All Macross era weapons are still in use to some degree. Explosive weapons have mostly been replaced with more effective models although stockpiles are still used to arm guerrillas and insurgents. RKG-8 Grenade: Soviet copy of the 'Cobalt Grenade'. Weight: .5lb, Eff. Throwing Range: 90ft, Damage: 1D6 MD, Blast Radius: 12ft. A Soviet variant of the RL-2 Super Rocket Cannon, they have made several modifications. A two shot rocket launcher, the E.B.S.I.S. had difficulty developing the miniaturization for the 'Plasma' mini-missile. Instead they made the launcher reloadable and capable of firing any of the other mini-missiles available. The Southern Cross never used mini-missile technology so these are uncommon outside of E.B.S.I.S. or allied territories. Weight: 16lbs, Damage: Varies, RoF: Twice, takes 2 melees to reload. Eff. Range: Varies by missile, Payload: Two. Must be fired in order of missiles loaded. 6B series combat vest. Commonly issued to ground troops and special forces, especially in hostile zones. Heavy but offers a fair degree of protection against S.D.C. weapons. Woodland green is standard but can also come in a variety of camoflage patterns. Has compartments for 2-6 magazines and extra supplies. The Soviet's response to the REF/UEEF's CVR-3 and S.C. body armor. By the time of the SDF-3's launch (Jan. 2023ad) The E.B.S.I.S. has made great strides in body armor development but is still behind the REF and SC. By the time the 2nd Robotech War begins (2031ad), the gap is nearly closed. Series Two Armor: MDC 40, Searchlight Shield 50MDC, 200ft range. Weight 16 lbs. At the end of the 2nd war, (Oct 8, 2032ad), the E.B.S.I.S. has matched the now debilitated SC and absent REF. 1. Complete E.B.A. (Environmental Battle Armor suitable for use in space and other hostile environments. 2. Computer controlled life support system. 3. Internal cooling and temp. control. 6. Independent O2 supply. 6hr.max. 7. Fire resistant up to 300deg. C. Plasma/Nuclear fires have full effect. 9. Helmet w/ removable face plate. 11. Infrared and passive night vision optic system. Range 120ft. 14. Back pack connectors. Not compatible w/ REF or SC units.